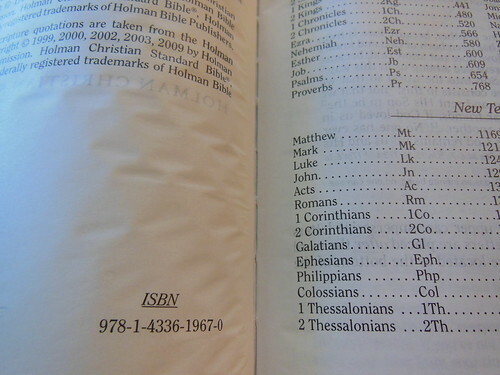 I want to get the failings of this Bible addressed right off the bat. In my opinion it fails at what it aims to accomplish. Here is a quote from the B&H product page, “Family, friends, and loved ones of military service members want comfort and guidance in how to pray for those in harm’s way and in how to cope with those tensions in their own lives so that they will have peace of mind. 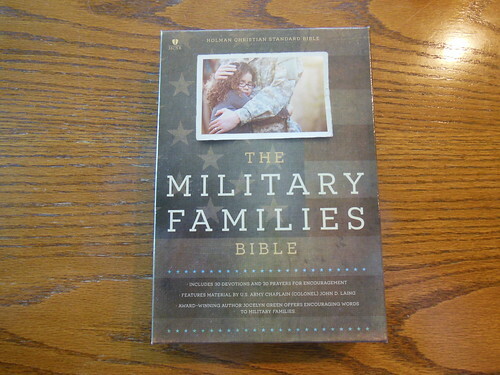 The Military Families Bible provides 60 pages of devotionals and prayers that minister to family members and loved ones of military personnel as well as equip the reader to minister to and intercede for those in the military.” All of these articles are in this Bible, but (come on, you knew there was going to be a but…) They are all in the back of the Bible. They don’t have page numbers, and they are not indexed in any way shape or form. You might be asking, “What’s so bad about that?” Well, say for instance you are having a specific problem, that one of these articles addresses, wouldn’t it be great to be able to look it up? The next problem is that these articles should be interspersed throughout the Bible and be attached to relevant scripture passages. As it is, they are just lazily thrown into the back of this Bible. Sure, it puts them in one convenient place to read, but they literally could be a separate devotional book instead. My final problem with the devotionals is that some cited scripture passages have been torn out of context and misapplied by the writer. This doesn’t happen a lot, but it shouldn’t happen at all. 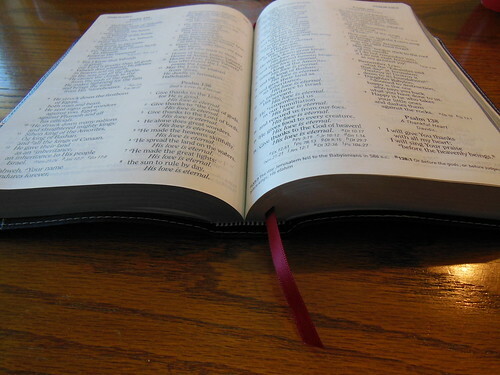 Now let’s get into the physical attributes of this Bible. 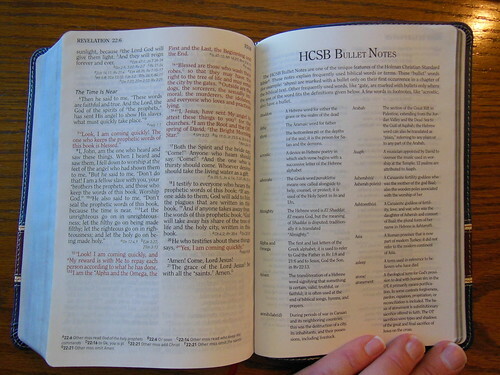 It is a handsome little Bible in the HCSB translation. It came in a two piece, sturdy, retail box. 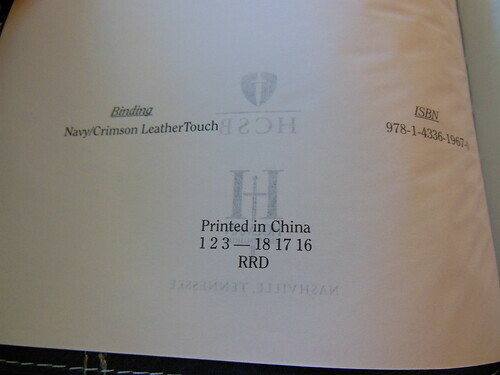 The cover is a synthetic Navy blue, and crimson color leather like material. 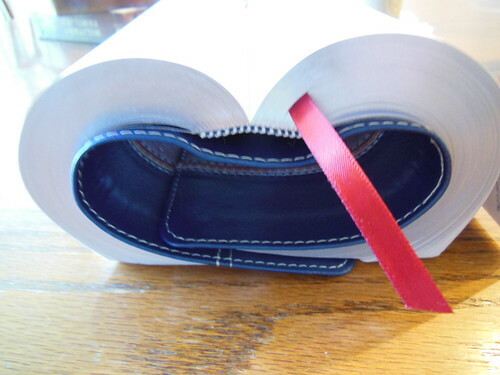 It is perimeter stitched and case bound, with a paper liner. 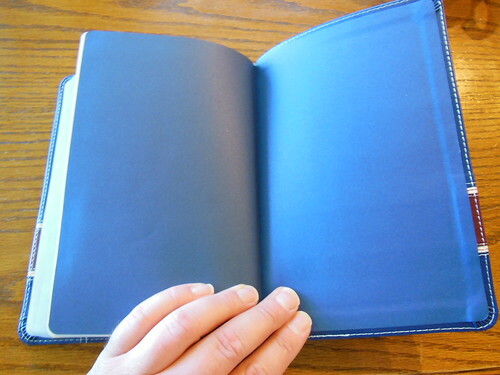 The page edges are silver, the spine and corners are rounded. 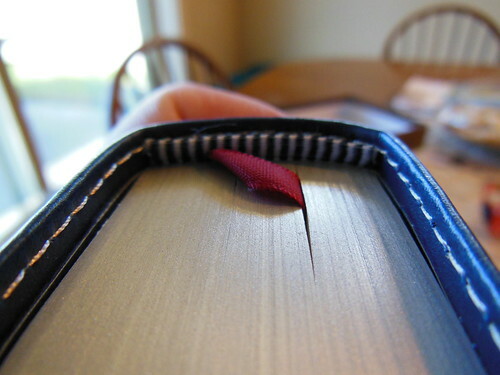 This Bible’s spine is smyth sewn, regardless of what the retail sites say. 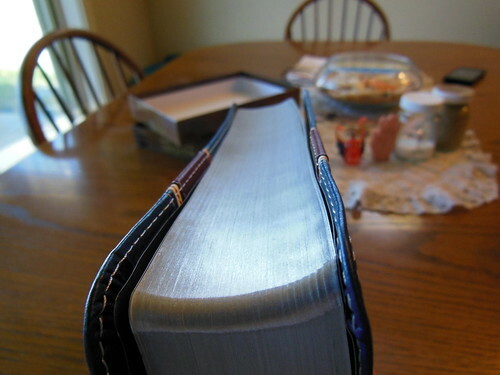 I found this Bible to be just the right size. 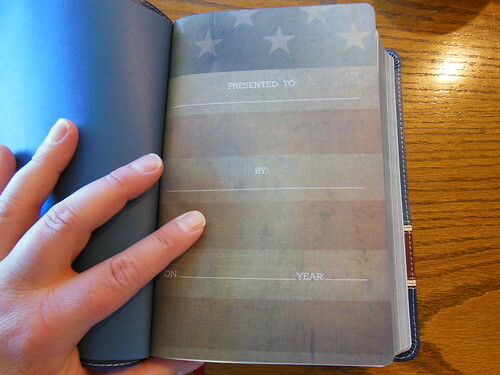 It measures approximately, 8 ½” by 5 ¾” by 1 ½” It is really more of a text Bible with devotions in the back. The paper is opaque enough, and the print is a 10 pt. 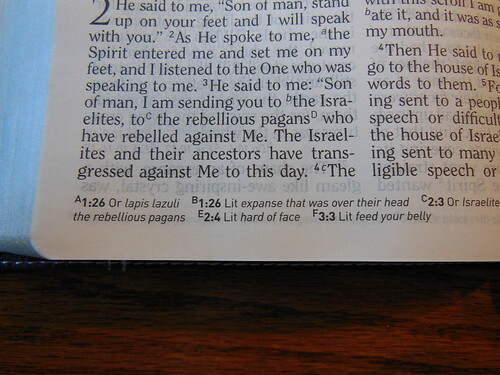 font, printed uniformly throughout the Bible. This is a double column, paragraph format, red letter edition. The red print is pretty average, not too bright, not too dull. 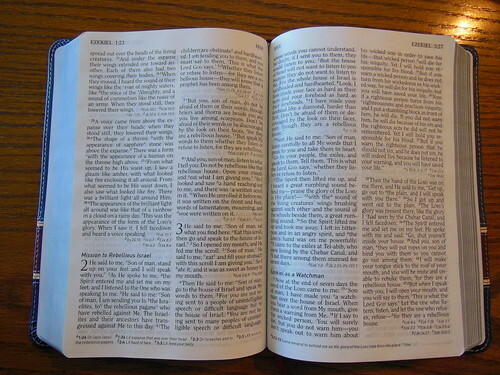 It is an easy to read Bible, mostly because of the size of the font. It would be even better if line matching was employed. While the paper is decent, and the font is a good size, there is still some ghosting. Limited footnotes at the bottom of the page reduce clutter. 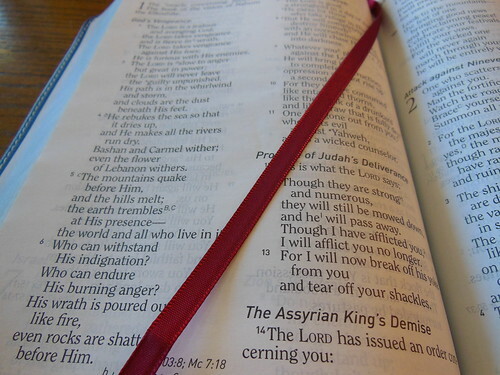 The sewn spine makes this Bible nice and flexible, right out of the box. 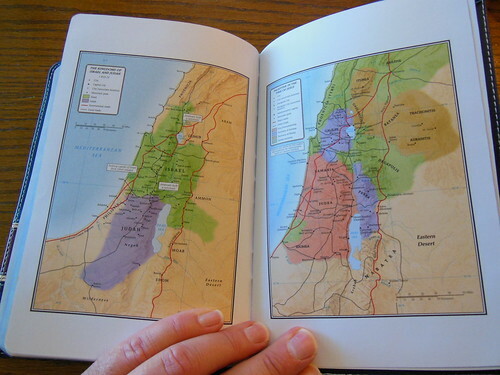 It lays flat on the table, and that is a big deal for an inexpensive Bible. 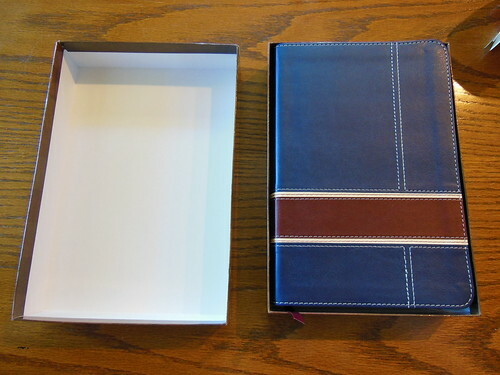 It truly is a great value with just the legibility and sewn spine. The 60 pages of devotional material are useful. Don’t get me wrong. I just wished a better implementation had occurred. 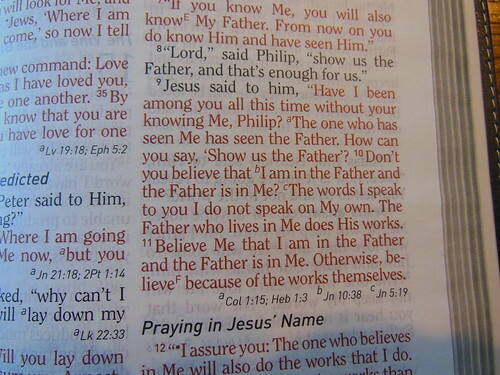 Of the 60 pages, 30 are devotions and 30 are prayers. I believe that theology makes a difference, and that a firm foundation in God’s word will help you through the storms of life better than anything else. The sovereignty of God, God’s omniscience, and omnipresence, as well as all that those attributes entail gives me peace and comfort in difficult times. 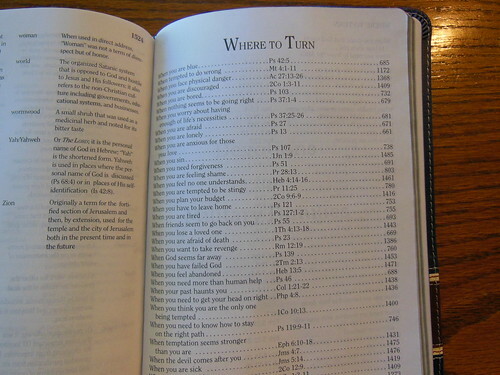 Besides these features there are HCSB bullet notes, “Where to turn to” scripture index, and 8 full color maps. Make sure to check out the rest of the pics at my Flickr page. You can pick up your copy at Christianbook, or Amazon.